Photos: These ceramic vessels were fired in an Anagama kiln by artist Terry Inokuma from Philomath, Ore. Wearable sculpture by Mary Darwall from Ivins, Utah. Susan Del Szajer from Silver City, N.M. creates fabric collage. One hundred and four artists. Eight local galleries. I spent Saturday afternoon at the Main Avenue Arts Festival. My goal: to find artists who stood out because of their aesthetic, their presentation, the conceptual message of their work or their purpose. Terry Inokuma from Philomath, Ore., was the first artist whose work captured my attention. Her wood-fired ceramic vessels are imbued with the spirit of the earth. 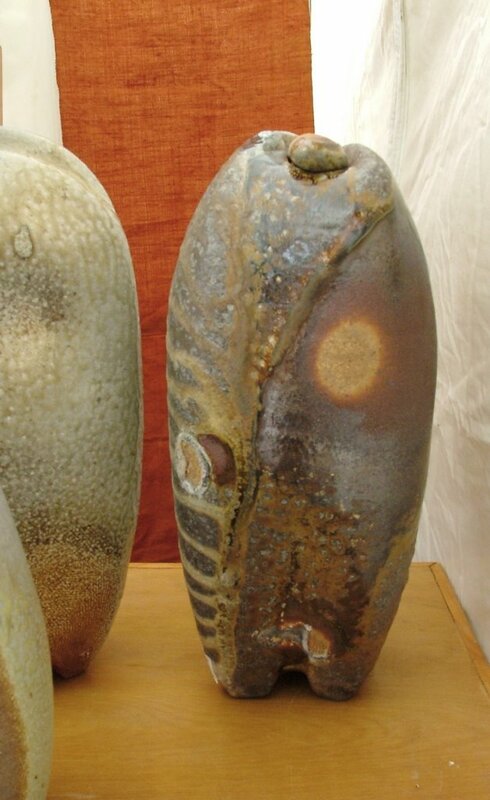 Fired for up to 100 hours in an Anagama kiln, Inokuma’s vessels have organic shapes similar to gourds, seedpods and rocks. The work is sculptural, but also functional. The firing technique provides glaze shades that are born of fire and earth, that capture something as impermanent as fire onto something as permanent as stone. Inokuma uses an ancient and unpredictable technique to create contemporary forms. Another artist working in a traditional method who caused me to pause and peruse was fine-art photographer Bryan David Griffith from Flagstaff, Ariz.
Griffith writes in his artist statement: “I rely on creative vision, mastery of traditional technique, patience and luck; not special filters, digital effects or process gimmicks.” To that I say, bravo. Griffith is a “real” photographer working with the traditional method of film and large format 4-inch by 5-inch and 6-inch by 7-inch cameras, creating silver gelatin color prints using museum-quality matting for his presentations. Perhaps this is why he stands out at an art fair where one typically sees digital prints and manipulated photographs whose origins are unknown and uncertain. Griffith’s work has that special something. It isn’t just an image of the Sneffels Range: His photography captures the emotion you feel when the light hits the peak and the clouds are pink and you suddenly see this one patch of flame-tipped yellow leaves on an Aspen tree in the foreground. That moment when the light and the view takes your breath away and you feel suddenly very alive and very small. Griffith’s work is all about slowing down and appreci ating the world around us. Some of his landscapes are highly abstracted and evoke the emotion of a Rothko painting. And his Compositions series includes close-up detail shots of peeling paint and rust that are brilliantly textured using line and color the way a painter would develop a canvas. Charles Timken from Lincoln, Neb., on the other hand, creates landscape-inspired abstract paintings with soft pastel pigments. Not a use of pastel we see very often in the Southwest. 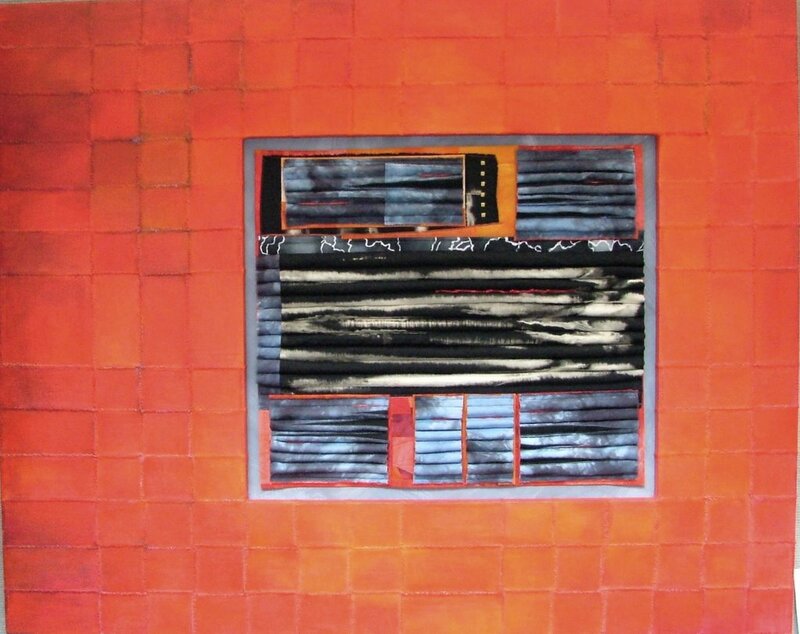 Timken’s compositions are masterful, reflecting his 25 years as a graphic and commercial artist. The color pallet with its soft orange, yellow and greens is vibrant and highlighted with reds and white. The work is all matted and framed with a simple maple frame. Timken also creates work that is a realistic representation of clouds or trees or rocks, but his abstracted landscapes created with soft pastel pigments on sanded paper evoked the most zeal for me through blocks of geometry and color. I also was drawn to the design elements in the work of Susan Dell Szajer a fiber artist from Silver City, N.M. It was clear that Szajer had mastered art and design and her chosen medium. A quilter for 30 years, Szajer creates paintings with hand-dyed fabrics and quilting techniques. Using the needle on her sewing machine, Szajer “draws” leaves, grasses and other details with rayon, silk or metallic thread. I found the technique similar to creating collage with paper, but Szajer uses fabric and a sewing machine. The patterns are geometric with organic elements interspersed. The color was intense. The lines were strong. 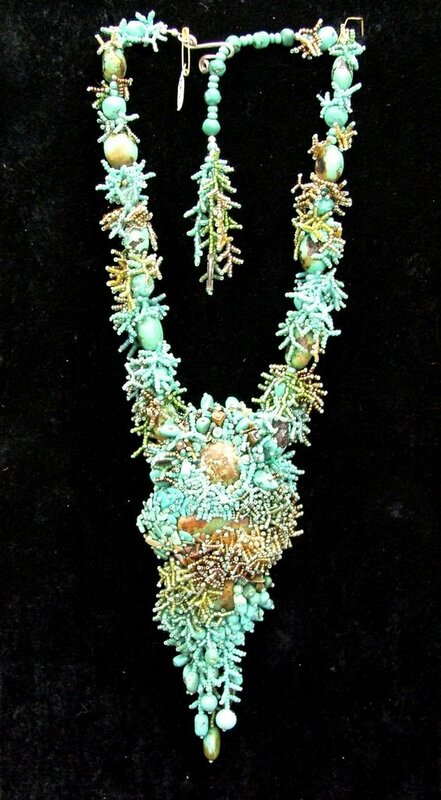 Jewelry artist Mary Darwall creates works of intense color and beauty as well. Darwall, a former teacher from Ivins, Utah, is a self-taught bead artist. Her jewelry is sculptural, created from cabochons and tiny seed beads woven with a needle that intertwines color, movement and texture. Each creation is wholly unique and involves 60 to 70 hours of detailed, meditative work. Truly this woman creates living works of art from semi-precious stones, glass, crystals and pearls: sculptures to wear inspired by the desert and the sea. Festival jurors Peter Karnen, Heather Laurie and Phyllis Stapler selected Durango ceramist Lisa Pedolsky as Best of Show in Fine Arts and Seattle-based Hans Christensen as Best of Show in Fine Craft. Pedolsky creates simple slab-constructed platters and vessels with pure geometric designs, circles and orbs cut out with layers of textured clay showing through. Christensen creates fine, hand-painted silk and velvet garments and scarves in intense hues and beautiful lines. I commend the artists who focus on art, on mastery of medium, on the elements of design and are able to express their own unique vision. And it was great to see the local galleries participating in the event and selling artwork from their tents. artsjournalist@centurytel.net Leanne Goebel is a freelance arts journalist based in Pagosa Springs.